Welcome to this month’s Blogorail Orange Loop. 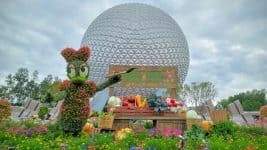 Today we are sharing what to do when you encounter a problem on your Disney vacation. It’s pretty much guaranteed that I will lose something on any vacation I take. Usually, it’s my sunglasses. On my honeymoon I went through 3 pairs in the span of a few hours. I always have to make note of where the Lost & Found department is. Sometimes, it’s something that isn’t so easily replaceable, like my camera. I’ve even experienced that moment of sheer panic that every parent dreads when we lost our son in a gift shop. While these stories had happy endings, I’ve learned that it’s inevitable that something will get lost while on vacation. Thankfully, there are things you can do to help prevent losing things, as well as give you a better chance of getting your stuff back quickly. 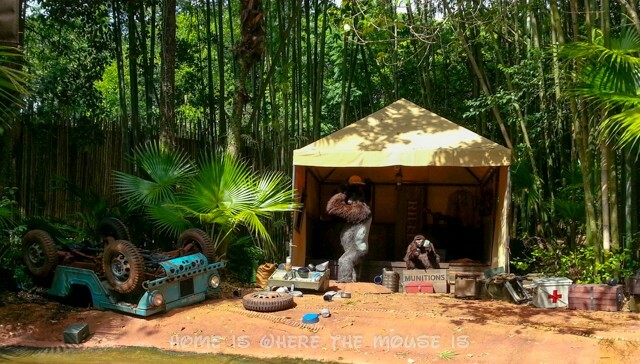 Disney has a team of Cast Members dedicated to lost things. 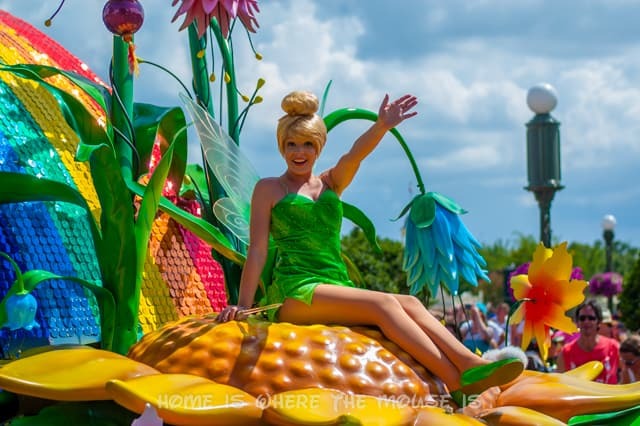 We’re not sure if Tinker Bell is one of them. 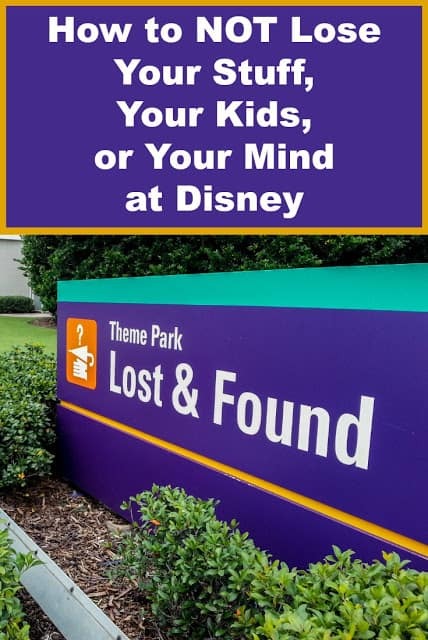 If you’re reading this post because you lost something at Walt Disney World and you haven’t contacted Lost & Found, call (407) 824-4245. For Disneyland, call (714) 817-2166. In the meantime, “an ounce of prevention is worth a pound of cure”. Be organized so you don’t have to tear the place apart looking for things. Losing your ID or Passport can prevent you from getting to your destination or getting home. Not having your reservation information or travel insurance can be a hassle as well. On one trip I printed out our boarding passes and other reservation information only to leave it sitting in the printer tray as we went out the door. Thankfully everything was in my email as well. 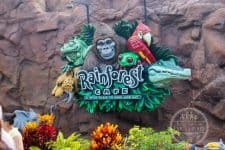 We’ve also had occasions where Disney’s computer lost our dining reservations or other information. Having copies of the confirmation numbers helped make sure we didn’t miss out on some of these experiences we booked so far in advance. I don’t think anyone really does the traveler’s check thing anymore. That was big with my parents. Now it’s all debit and credit cards. Only take what you need. Leave the rest at home. Bring at least one card for emergencies. Have your bank and credit card company phone numbers in case you need to call. Notify your bank and credit card company that you will be traveling. Pack only in carry on bags and keep in hotel safe. I’ve yet to lose my wallet while on vacation, but I have had my bank freeze my account because they suspected my card was stolen. You should notify your bank and credit card companies that you are traveling to prevent this. If you are staying at a Walt Disney World Resort, MagicBands are a great way to minimize carrying cash and credit cards at the park. The bands themselves can become lost. Writing your name and cell phone number on the band makes it easier for a Cast Member or a thoughtful guest to return it to you. You can have more than one active MagicBand, so if you happen to have some older ones, you can bring them as backup. Losing one is a matter of inconvenience, but you can rest easy knowing that your charging privileges are protected by a PIN and your tickets require your fingerprint after your first use. I’ve found that MagicBands stay on your wrist fairly well and the fact that they are waterproof means you don’t have to take it off to go swimming. We’ve had more problems finding the kids’ MagicBands in the hotel room as we got ready in the morning. Yes, you could sleep with them on, but it’s probably better to put them in the same place each night so you know where they are in the morning. 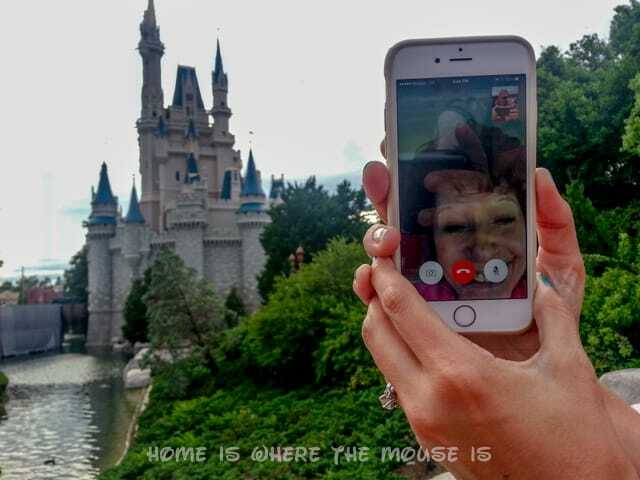 Keep a firm grip on your phone when your in the parks. Losing a phone can feel like you’ve lost a part of yourself. We’re so connected to our phones these days and we keep a lot of sensitive information on them. Use a Password or Pattern to lock your phone. Install app for locating phone. Last summer, my phone went missing after our son got sick inside the Starbucks at Disney’s Hollywood Studios. We looked everywhere and couldn’t find it. We had Cast Members helping and I went over to Guest Services twice. I was told the only thing I could do was check back later if anyone turned it in.We gave up the search and resolved ourselves to the fact that the phone was gone. A short while later, I took Jackson out of the stroller to take him into the bathroom and there was the phone! He had been sitting on it the whole time. Still not sure how it got under him. A camera is not only expensive to replace, but when you lose it you also lose all the pictures you took, which can be an emotional blow as well. Put your camera in your park bag when not being used. Take a picture of your contact info and/or label your camera or camera strap. I’m notorious for putting my camera down and then forgetting to pick it back up before walking away. Several times I’ve gotten a few hundred feet away before realizing and going back for it and finding it where I left it or turned in.The worst was when I lost my camera in Epcot and couldn’t remember where I put it down. Cast Members and Supervisors helped try to find it. A trip to Guest Services turned up nothing. On that occasion I was given a form to fill out to report the lost item and was told repeatedly that Cast Members would send any item they found to the front of the park immediately. After that, I retraced my steps all the way back to a gift shop in World Showcase resulted in finding it in the hands of a Cast Member who held on to it in the hope that I would come back. So much for procedure. Jewelry, hats, stuffed animals, etc. There are many things we take with us for personal reasons that are easy to lose. Every extra item is one more thing to keep track of. Make a list of the items you brought, especially what your kids pack in their bags. Do a thorough sweep of the hotel room and rental car before you leave. Label anything that can be labeled. 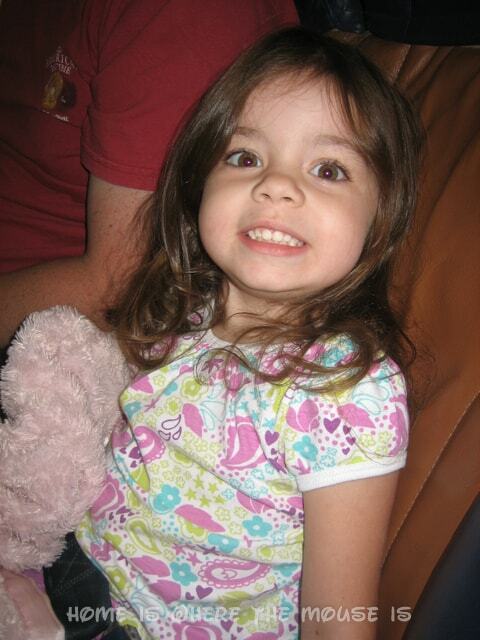 One time, we left Disney’s BoardWalk Villas without Bella’s most treasured possession: her “Blankie”. She was devastated. We didn’t realize until we were long gone and on the way home. We called the resort and informed the front desk. They found her Blankie when cleaning the room and they sent it to us in the mail. We told Bella that Blankie got to spend a little extra time with Mickey, and that he made sure Blankie got home. Don’t leave valuables in your stroller when you park it. Then there’s the time our stroller went missing. Turns out that another family had the exact same stroller and didn’t realize they took ours. We didn’t put our information on ours, but thankfully they had labeled their stroller, which was left outside the attraction near ours. I was able to call and arrange to swap strollers back, along with the personal items that had been in them. 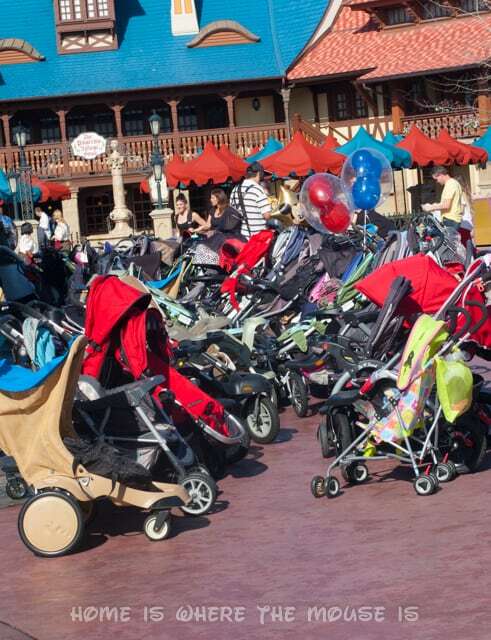 A lot of people use strollers to keep items in that they don’t want to carry on every ride. Decorate your stroller. Make it easy to distinguish. Tether child’s items to the stroller in case they drop them. Use a storage locker at the parks. Send packages back to resort instead of carrying them around. Almost everything can be replaced, except our children. 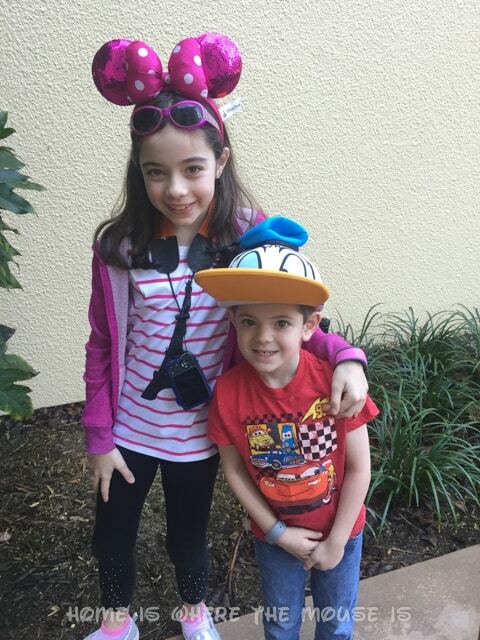 Keeping your children safe while at Disney is a subject that Lisa wrote about not too long ago. She recounts the story of how Jackson disappeared on us at Disney Springs. It was a nightmare, but thankfully he was just hiding from us. Disney is amazing when it comes to missing children, but there are things you can do to help keep children safe should you be separated. Tag them with tattoos or MagicBand with contact info. Take a picture each day so you can show Cast Members exactly what they are wearing. I would never wish losing a child on anyone. 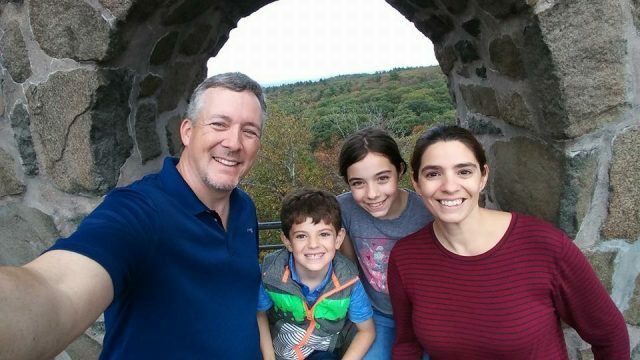 I’ve been on both sides of it, and these are great tips for speeding up the process of reuniting parent and child. Every second seems like an agonizing eternity in these situations.If your child gets separated from you, notify the nearest Cast Member and use that picture you took that morning to show exactly what they were wearing. They’ll enlist Disney Security to help. In both Walt Disney World and Disneyland Resort theme parks, children found by Cast Members are escorted to that park’s Baby Care Center and kept company until they can be reunited with their loved ones. In most cases, the best hope of getting something back is going back to the spot where you left it or dropped it. If it was on a ride or attraction, that may not be possible as Cast Members might have to wait until after the park closes. When I worked at Magic Kingdom on the College Program, my supervisor walked me through Splash Mountain after closing and explained how they drain all the water out of the attraction each night and find dozens of hats and other items that get sent to lost and found. 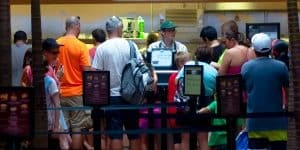 Disney has a system in place for sending lost items to a central lost and found where they can be reunited with guests. But that takes time, and in my experience, Cast Members realize that guests may come looking for their item. There’s also a chance that another guest may find your item. If it’s unlabeled, they may just turn it in to a Cast Member. But if there’s a way to contact you, you’d be surprised how many good people will make the effort to get your item back to you. Disney will hold on to most items for 30 days, and will hold on to highly valuable items for up to 90 days. 1. 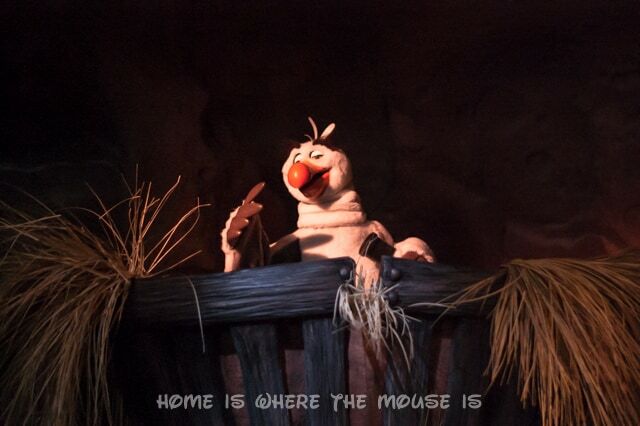 Check with Cast Members at the nearest location to where you think you lost your item. 2. Check with Guest Services at the park, which collects items throughout the day. WDW’s Wide World of Sports Complex keeps lost items at their Guest Services location. Check with Lobby Concierge and Front Desk of the Resort. Cast Members on buses will turn items in to the Lost & Found at the TTC. For monorails and boat transportation, it could make its way to Guest Services or the Lobby Concierge at a Resort before making its way to Lost & Found. Wow, that’s a lot of information. But sometimes being armed with information ahead of time can help you not get overwhelmed when you find yourself in an unexpected situation. When you lose something or someone, the most important thing is not to lose your head. Do you have any tips or stories of your experiences with losing an item at Disney? Share them with us and our readers! 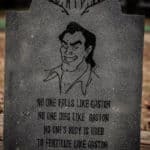 We lost Ashley once – at a local amusement park – and those 3 or 4 minutes felt like an eternity! We had our stroller STOLEN while at Disney once – thankfully, I had my camera with me, but the bag and all the equipment was lost. We found the stroller later – abandoned – but everything else was gone. Disney did replace our spray fan (they have TONS of them in Lost & Found), but I had to go to BestBuy and replace my camera equipment. Knowing all these tips and putting them to good use could help avoid some real disasters! Thanks for putting this all together! So many great tips! We try to keep a handle on all of our stuff during our visits to Disney but we've misplaced things along the way and the Cast Members have always been great when we've needed help locating misplaced items. One year my child left his cell phone on a table at Disney Quest. He did not even know he had left it. I got a call from the phone but it was from a CM telling me where I could pick it up. The CM just phoned Mom listed under the contacts. Wonderful advice! My hubby was so worried about losing the Magic Bands on our last trip that he actually made the boys take them off in the Honey I Shrunk the Kids play area. I lost my sunglasses once and was floored that they were found. So it is always worth a shot to try Guest Services. They really try hard to return things to their owners.